"Really happy with the service. The delivery is always nice and quick. The ordering process is really straightforward." 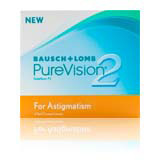 The PureVision 2 HD for Astigmatism lens is one of the newest contact lenses on the market for the treatment of astigmatism. 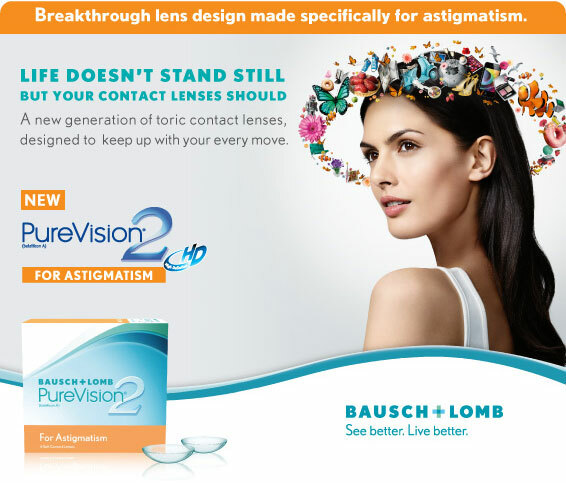 These contact lenses incorporate the latest and most advanced technology by Bausch and Lomb including their new High Definition Optics design. This means that the lens is specially formulated to reduce halos and glare to give users the most spectacular vision with crisp views and clear vision even in dim conditions. While this technology is available in their new lenses, this is one of the only toric lenses that include the High Definition technology. These contacts feature the Auto Align Design that cooperates with the eyelid to keep the lens in place, no matter the activity or conditions. This means that the need for adjustment and moments of blurry vision is eliminated. ComfortMoist technology used in the lens design keeps the lens rich in moisture while in the package, ensuring immediate comfort when placed in the eye. The thin lens design also makes the lens feel more natural in the eye even at the end of the day.